Meanwhile, Mr. Lopez graciously gave permission to RealityStudio to excerpt the third chapter from his catalogue, which gives an excellent overview of the contents of the archive. The chapter was written primarily by Bob Moore. This collection of materials, the “Vaduz Archive,” was originally assembled by William S. Burroughs and Brion Gysin in 1972 and catalogued by Barry Miles (published as A Descriptive Catalogue of the William S. Burroughs Archive, London, 1973). The material ranges from the early 1950s through 1971 and covers the author’s movements from Morocco to Paris, London and back to the U.S. Much of the material dates from roughly around the time Burroughs first met Gysin and fully details their collaborative work at the “Beat Hotel” in Paris and then London, from the inception and application of Gysin’s “cut-up” technique through film, performance, audio and visual work. 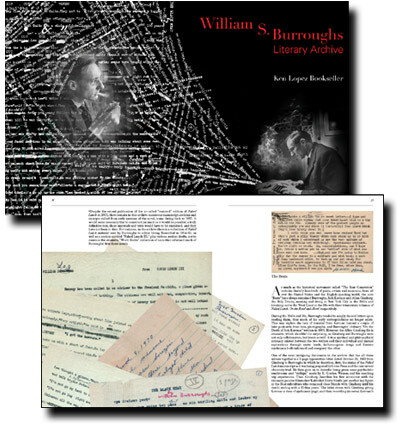 The archive includes numerous original drafts of Burroughs’ early books and publications; over 11,000 pages of manuscript material, much of it unpublished; some 3,000 pages of highly personal literary and artistic correspondence; original collaged dream calendars; diaries and holograph notebooks; hundreds of cut-ups; unreleased tape recordings; folders of original photographs both by and of Burroughs; his avant garde publication archive; and numerous folders of personal research. This collection also includes much of Brion Gysin’s own literary archive (original manuscripts, calligraphy, literary correspondence) from the time of the very first cut-ups in the late 1950s through 1963. Moreover, the collection contains much unique and/or unpublished material by their collaborators and contemporaries, both literary and artistic. The placement of this collection in an institution will inaugurate an entire new era in Burroughs and Gysin research, publication and appreciation, in particular their early relation to and involvement in avant garde art, film, and even poetry. Among the highlights are the original Queer manuscript from 1952 (as well as attendant materials from the 1985 publication) and excised and variant manuscript material from all of Burroughs’ books from Naked Lunch to Ah Pook is Here, including Minutes to Go; Exterminator; the “Nova Trilogy” of The Soft Machine, The Ticket That Exploded and Nova Express; Dead Fingers Talk; The Wild Boys; The Last Words of Dutch Schultz; The Job; The Third Mind; et al. Also, there are literally dozens and dozens of shorter pieces, “routines,” cut-ups, essays and film scripts that do much to fill in and illuminate both Burroughs’ literary oeuvre and modus operandi. On a deeper level both artistically and psychically are Burroughs’ dream calendars, working notebooks and diaries, not to mention his own photography, film and performance notes, all of which inform the purely literary output. Burroughs was also an avid correspondent and his correspondence files are full of lengthy, dense, and revealing letters from notable literary figures such as Paul Bowles, Allen Ginsberg and John Giorno to a widely disparate array of 1960s-era poets, painters, fimmakers, composers, science fiction writers, drug smugglers, rock musicians, underground editors, lovers and critics. The Vaduz archive also contains Burroughs’ research files into subjects ranging from Scientology to Egyptian heiroglyphs, time studies, bio-feedback, drug addiction, homosexuality, totalitarianism and the criminal underworld. One could almost say that Burroughs himself was a walking fourth-dimensional collage of his own life, moving through numerous avant garde milieus, suitcase in hand, hat askew, completely at home with no fixed address. As much as Burroughs was “l’hombre invisible” and ghost in the machine of late 20th Century avant garde activity, it is nonetheless astonishing to see in this material just how far his connections to various avant gardes extended, from Surrealism to Fluxus, from British “New Wave” Science Fiction to underground film circles, from Beat and Post-Beat beginnings to Concrete Poetry and beyond. His adventures in consciousness, sexuality and writing led him like a thin phantom from the streets of New York City to Mexico to the jungles of South America to Morocco, Paris and London. Wearing his signature slouch hat with a cigarette burning eternally from between stained fingers, Burroughs somehow embodied the form of fictional crime fighter, The Shadow, taking it upon himself to know exactly what evil lurked in the hearts of men and report on it. In this way, he came to fully understand the natures of Addiction, Control, Police States and Viruses, thus eerily predicting the late 20th Century crises of AIDS, the Internet (and its panoply of “Viruses”, “Worms,” “Hosts,” and “Spyware” not to mention the pervasive virus-like affliction called “Information Sickness”), the wars on drugs and terrorism, the cultures of Information and Surveillance, dissolution of national borders in Africa and elsewhere, and the pervasive presence of War itself. Burroughs’ vision is cold and chilling, not because he was a cold and chilling individual, but because he saw through the rosy patina of the post-WWII world to a darker underlying reality-not only “nature, red in tooth and claw,” but human nature “red in tooth and claw.” His scrapbooks are filled with disturbing imagery of street riots, race riots, child soldiers with machine guns and machetes, voodoo masks and dystopic science fiction. Although the material only chronologically extends up through 1972, it fully anticipates the psychic, political, social and sexual chaos of the next 33 years. Moreover, the archive specifically details piece-by-piece Burroughs’ and Gysin’s “cut-up technique” that, while perhaps initially perceived as a mere literary device or worse, gimmick, has actually been more-or-less the defining form (trope?) of post-WWII culture world wide. Burroughs and Gysin’s initial crude experiments with chopping up and re-arranging bits of paper, pages of text, strips of film stock and audio tape have since been reworked and refined to almost the Nth degree, anticipating and providing the groundwork for artists working in such disparate fields as concrete and sound poetry; dub reggae; psychedelic rock music; industrial and experimental music; underground cinema and video; punk rock and even hip-hop, all the way to contemporary television advertising, news and music videos. However, whereas Burroughs’ original intention was to unlock (and thus free) the Imagination, the techniques seem to have been co-opted by the society at large to serve Control and render the Imagination of its subject impotent by the endless streams of shifting, transitory, shock images and sound-bites. For example, while one salient, shocking Vietnam War image in 1968 once shifted a nation’s attitude toward war, thousands of such images, broadcast repeatedly, can only lead to disinterest, apathy and boredom. Certainly Burroughs and Gysin have provided a springboard for future generations, but their unique discoveries and experiments were in turn a culmination of various European trends ranging from the early Dada poetics of Tristan Tzara and Hans Arp, the collage work of Kurt Schwitters, through several decades of Surrealist activity to Parisian Lettrism and Situationist strategies. One of the most widely held misunderstandings about the avant gard(s) is that avant garde activity is primarily the work of wildly original, lone individuals. In actuality, nothing could be further from the truth. Avant garde activity is, almost by definition, group activity and collaborative work. One of the truly wonderful aspects of the Burroughs archive is to see first-hand just how closely connected he was personally and collaboratively to all sorts of widely disparate avant garde groups. For it is not simply his original involvement with the Beats that characterizes Burroughs’ true contribution to world (counter)culture, but his pervasive and sinuous presence in and among almost every important breakout avant garde movement of the 1960s: again, from Fluxus to concrete poetry to underground filmmaking to the drug subculture to the Mimeo Revolution and beyond, Burroughs was there, collaborating, contributing, corresponding, giving interviews and constantly provoking the whole way. In fact, simply the list of individuals who have collaborated with Burroughs comprise a who’s who of international underground literary, artistic and film activity. An incomplete list from this archive would include Allen Ginsberg, Jack Kerouac, Gregory Corso, Brion Gysin, Henri Chopin, Bob Gale, Keith Haring, David Budd, David Prentice, Carl Weissner, Claude Pelieu, Anthony Balch, Sinclair Beiles, Harold Norse, Earle Browne, Conrad Rooks, J.G. Ballard and John Giorno. Later collaborators, as Burroughs’ influence continued to percolate throughout contemporary culture, included David Cronenberg, Laurie Anderson, Charles Gatewood, S. Clay Wilson, Robert Frank, Philip Hunt, Derek Jarman, Ridley Scott, Gus Van Sant, Genesis P. Orridge, Robert Rauschenberg, Robert Wilson, Kurt Cobain, and many others. The archive details Burroughs’ role as collaborateur par excellence before 1972 via correspondence, unpublished experiments and collage. Indeed, some of Burroughs’ early, important collaborative visual works (esp. w/ painters David Budd and David Prentice) remain to this day unknown or lost and can only be guessed at through the letters in this archive. Published on RealityStudio.org in April 2006. Many thanks to Ken Lopez Bookseller.